Very close to groceries and public transportation. Clean apartment. WiFi was excellent! Clean room, great location, nice stuff. Looks exactly in the pictures. Location is good for family. Nice modern area. Restaurants, coffees and shopping center so close. Great place . All in one . All things that you need is 2 min away. I came by car so have no idea about how close are public transport stations but there are lot of parking places and garages . Garages is 10-15 € per day . During weekend is free on streets . Location is great, and hotel is in a really nice neighborhood. The apartment was spacious and comfortable. It was very clean and convenient. I liked the style! Easy access and location in city. We enjoyed the upgrade to a one bedroom apartment and the complimentary tea. Suggest that a couple more tea bags would be nice. Lock in a great price for Sun Resort Apartments – rated 8.5 by recent guests! 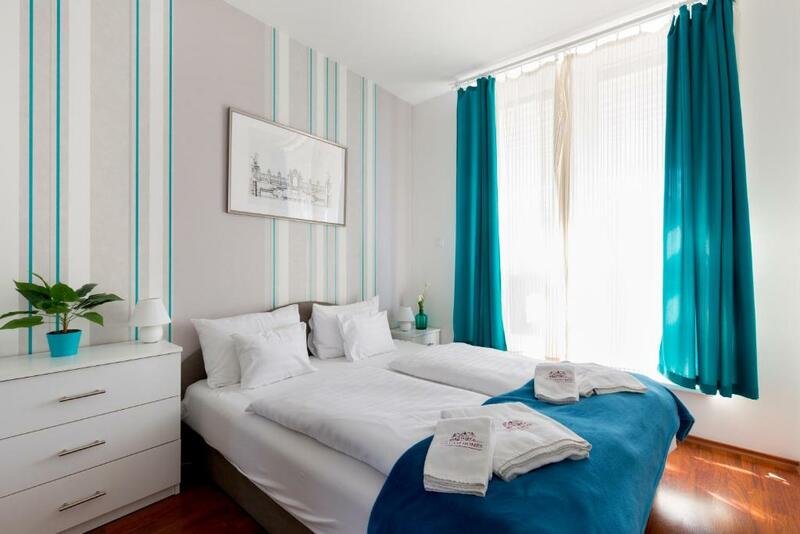 Sun Resort Apartments is located in the new Corvin district of Budapest and offers a self-catering accommodations, luggage storage is available The property is set just behind the Corvin Plaza Shopping Center and next to a pedestrian street with restaurants and bars. All units in Sun Resort Apartments come with a private entrance, a living room with a flat-screen TV, a fully equipped kitchen, a dining area and a private bathroom with a shower and a bath tub. Most units also have a washing machine. All the apartments are air-conditioned. It comes with an additional cost. Upon arrival at the property guests are provided with complimentary coffee and tea. Upon request, Breakfast Box is available at the reception every day from 8:00 until 10:00. The nearby wellness center featuring a swimming pool, saunas and a gym is accessible for the guests for an additional charge. The property sells the tickets. The nearest metro station is Klinikák on line M3, reachable within 1640 feet, while the Grand Boulevard with the nonstop tram line 6 is at the distance of 2,300 feet. The Old Downtown is located 1.1 mi away, and the Gellért Thermal Bath and the Hungarian National Theater are located 1.5 mi away. 뀐 Located in the top-rated area in Budapest, this property has an excellent location score of 8.8! When would you like to stay at Sun Resort Apartments? This studio comes with a private entrance, a living room with a flat-screen TV with satellite channels, a fully equipped kitchen, a dining area and a private bathroom with a shower or a bath tub. Guests receive free coffee and tea upon arrival. Most units also have a washing machine. This apartment features a kitchenware, stovetop and oven. Guests receive free coffee and tea upon arrival. Most units also have a washing machine. This studio has a toaster, kitchenware and microwave. This apartment features a balcony, toaster and washing machine. 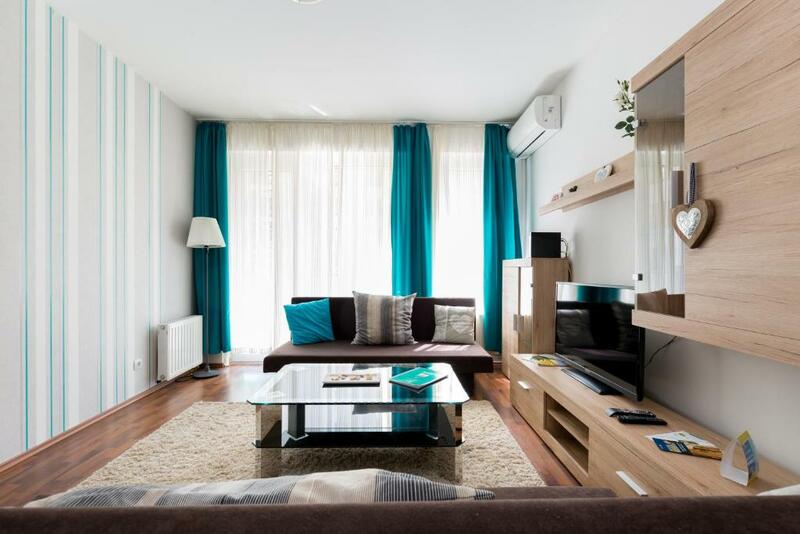 Stay at one of our brand new serviced apartments in the newly built Corvin Quarter in the centre of Budapest! Modern, nicely furnished and quiet apartments with fully equipped kitchens are available in a new building. There is free wifi at each apartment! Ideal for tourists as well as business travellers as it is centrally located and the airport is also easily accessible. 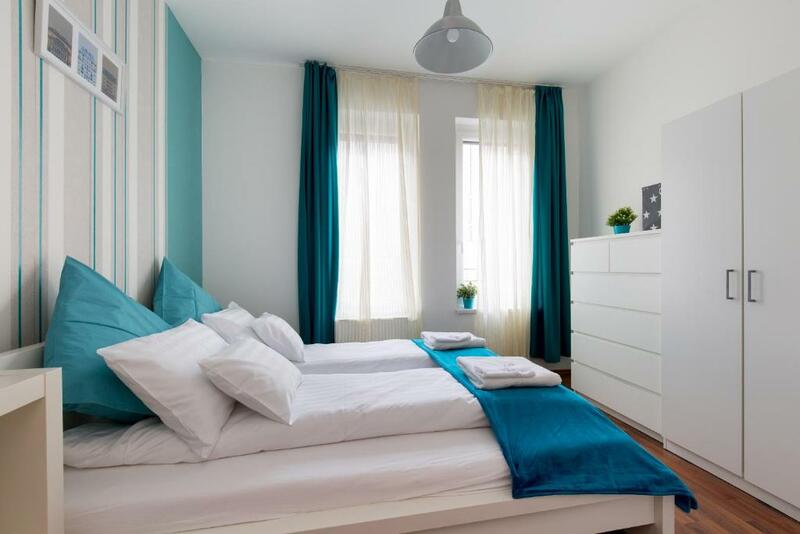 Our business is founded to provide high-quality, friendly service to our guests during they stay in Budapest in our nicely designed, well-equipped holiday properties. We manage our well equipped apartments from 5 years, you can find our reception on promenade, between Lidl and Las Vegas Casino in the BC building from 8:00am to midnight every day. 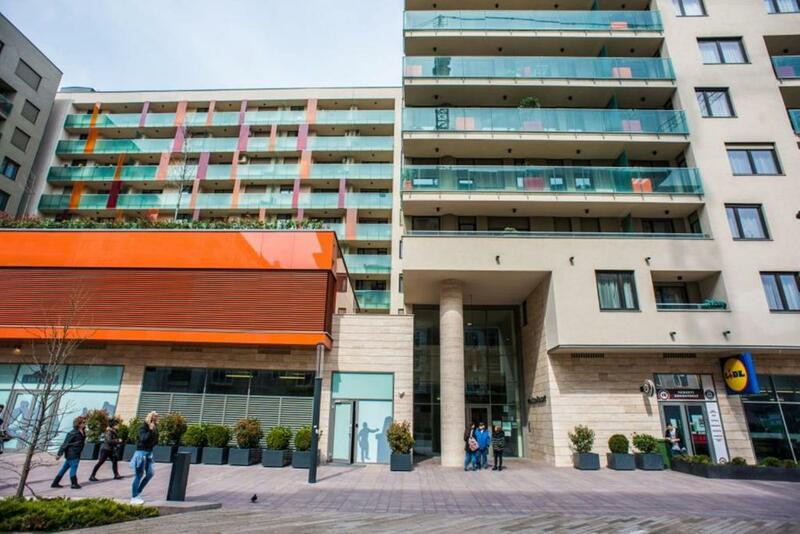 Corvin Quarter is a newly built area in the centre of Budapest. 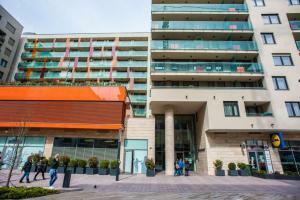 Our serviced apartments are located in the Corvin Promenade, where you can find cafés, restaurants, shops, etc. There is a shopping centre (Corvin Plaza), a Fitness-Wellness centre (Life 1 Wellness) and a multiplex cinema (Corvin Cinema) in 100 metres. The historical part of Budapest can be reached in 15 minutes on foot. In a couple of minutes there is a metro station (Corvin negyed) and a tram stop (nr. 4 and 6 – runs all day and night) in the Grand Boulevard. 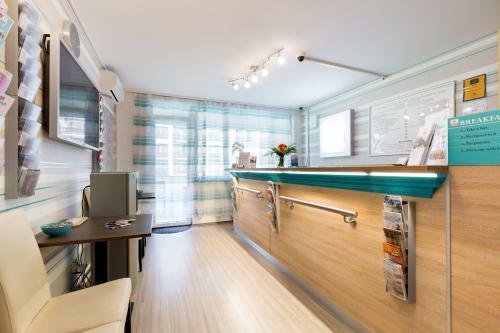 The clinics of Semmelweis University are located in 10 minutes on foot. The Corvin Quarter is the most accessible part of the centre from the airport, so you can save time if you choose this location. Area Info – This neighborhood is a great choice for travelers interested in city trips, architecture and history – Check location Great location - show map Guests loved walking around the neighborhood! House Rules Sun Resort Apartments takes special requests – add in the next step! A EUR70 damage deposit is required on arrival (around USD78.42). This deposit will be fully refunded 7 days after check-out, as long as there isn't any damage to the property. Debit card Sun Resort Apartments accepts these cards and reserves the right to temporarily hold an amount prior to arrival. Sun Resort Apartments accepts these cards and reserves the right to temporarily hold an amount prior to arrival. Please note that the reception is located on the walking street -"A" gate- on the second floor. Working hours are from 08:00 until 24:00. A surcharge of EUR 20 applies for check-in and check-out outside reception opening hours. All requests for early or late arrival are subject to confirmation by the property. If you expect to arrive outside check-in hours, please contact the property at least 1 day in advance. Contact details are stated in the booking confirmation. In case of booking for 6 nights or more, different policies may apply. A damage deposit of EUR 70 is required on arrival. That's about 78.42USD. This will be collected by credit card. You should be reimbursed within 7 days of check-out. Your deposit will be refunded in full by credit card, subject to an inspection of the property. Please inform Sun Resort Apartments of your expected arrival time in advance. You can use the Special Requests box when booking, or contact the property directly using the contact details in your confirmation. The apartment was extra dirty. It has not been cleaned properly since the opening. The kitchen and kitchen garment were greasy, they haven't been cleaned after the previous guests and long time before that :(. The floors and carpets were dusty, full of dirty stains, and not cleaned for a very long time. We didn't event step out to the balcony because it was also dusty and full of stains all over. The bathroom was not in such a bad condition, but not properly cleaned, I found hair in the bathtub. All over, I wouldn't mention some individual and accidentally missed dirty spots, but it is obvious that the place is totally rusty and not being managed and supervised. Otherwise, the location is very good, neighborhood also, but if you appreciate clean space better avoid. Some years ago the room was much better. No curtains in bedroom to keep sun out. No classical toilet paper, but cut paper. 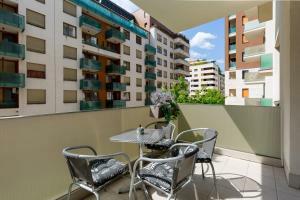 Great location, close to the city center, metro station and there is a shopping mall nearby. Super great apartments! Really clean and cosy. Very close to public transport and city center. 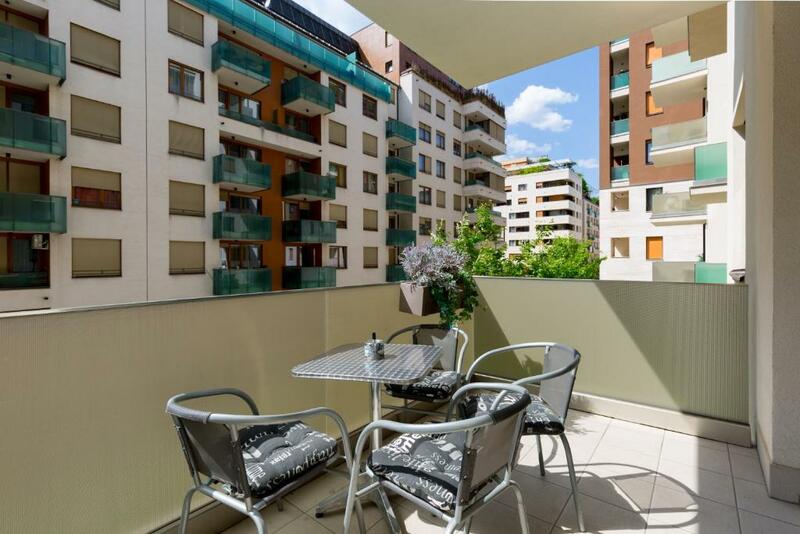 Great location, clean apartments, big bathroom, balcony and very kind stuff. Will come back for sure. Beautifull appartment and kind staff. Highly recommend. The bed was too hard for us & the heating was broken at 30degrees constantly in the apartment. We had the handy man come to fix it but it but unfortunately this was not successful. The location was great with lots of shops and restaurants on the door step, the facilities in the apartment was everything we needed and more and last but not least the staff at reception were very kind and couldn't do enough for us, even printed out boarding passes! 1-I did not like the fact that while we were there, the electricity switches fell twice; Once whilst we were returning to the apartment, during the night, resulting in us pulling up a chair in the dark to try and turn the electricity back on. And another time we noticed in the morning when the light wouldn't turn on in the bathroom. So then again we noticed the switch fell. Again. 2-I did not like the fact that unlike other apartments (in that same area), 'Sun resort apartments' do not show you the apartment. They expect you to go to some sort of reception to get a key and pay a deposit ( which is very troublesome to get back if you are checking out of the apartment during "closing" hours and are using a visa from abroad). Now for people that come from abroad, that don't know Budapest, I would suggest that they should go downstairs help them find the reception in whatever building on whatever floor it is. Show them what other building to go to where the actual apartment is. It's common courtesy. I understand the hotel-like thing they're trying to do, but it just made the entire thing seem odd and a little awkward. 1-The location was the best thing about it. Next to the mall, Lidle, restaurants, money exchange place. 2-Wifi was working perfectly fine too; Connected instantly and remained connected without random cuts. Very strict about the check in policy, arrived at 2 pm while the check in time is 4pm, and they will not me check in early without paying 10 euros for just 2 hours! Very strange... I will not recommend this place in case you might need either an early check in or a late check out. They were very strict about it even my arrival was in February which is not busy month of the year. Close to the mall and coffee shops and restaurants. The bed was very creaky. Everytime I moved it woke me up. The location of Sun resort apartments is great. There is a lot of restaurants, bars and cafe in the area. There is also Lidl shop and shopping center almost right at your doors. The Corvin setaty street/square is very clean and pleasant. Also the metro stations are not so far. Traveling to the city center is very fast. We enjoyed the stay very much. I appreciated the kitchen equipment and the location (it’s not far from the airport and city centre).